You are letting your “niche” love of modern architecture blind the reality of what the majority likes. Believe it or not there is still truth in this world and your personal tastes don’t dictate that truth. Just because you like something does not change reality. 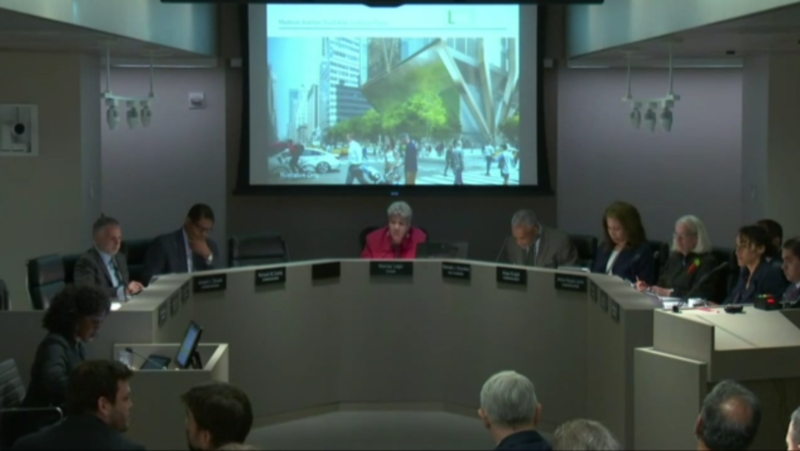 The firm plans to submit a revised plan for the structure at a City Planning Commission hearing scheduled later this month. The new blueprints would increase the size of a public open space from 7,000 square feet to 10,000 square feet, and would make the area open-air instead of enclosed as in a previous design. There’s one good bit of news for NY. Am I the only one who doesn’t care about 3K sf of outdoor space if they compensate for it in some small way? $500K for the 53rd and Lex subway station and I’d let them eliminate it altogether. I believe which ever version arises, it will be taller, as those massing models are to the bulkhead. You are not the only one. Those dumb windswept plazas were from the Corbusian 60’s era. They are everywhere in Midtown. We don’t need any more. But NIMBYs love them because of the “open space” part and we know NYC’s zoning is mostly based on NIMBY input. I HATE those too. I’d rather have more housing and office space. Who actually spends time there? Funny, I could say the same thing to you. You think you know the will of the masses, unless you’re possessed of some mind reading power that the rest of us mere mortals lack, I doubt it. Your supposed truths aren’t nearly as objective as you think they are, we’re just going to have to agree to disagree on this, since neither of us is going to budge. Yea there is to way no know if the masses like pizza either. Public space is excellent way to provide an escape from the monolithic landscape - whether its for a smoke break or just to be able to look around and not just see banal office buildings in every direction. But this building is not bulldozing a public park, somewhere the public currently gathers. Mies van der Rohe innovated the grand public plaza on private land to enhance the prestige of the Seagram building and it has worked in subsequent instances since. However, since this was never a gathering spot in the first place I think there should be a mechanism for getting a public good for eliminating a dubious public benefit, i.e. paying into a fund for subway upgrades. Amanita - I’m with you that tearing down the current building is a bit tragic, but the office stock in Midtown East isn’t aging well as evidenced by the popularity of Hudson Yards. In the end these are office buildings, not monuments. your source appears to be credible. Early renderings of the POPS were grabbed by nyguy on skyscraperpage who was watching the stream. I think we can all live with that, a quasi-425 Park. Let’s hope it turns out to be similar. I surely hope it won’t be disappointment, but judging from that screen shot, “could” be a nice tower. The base looks amazing. Doesn’t look like it’ll be just a boring glass box. If Foster pulls a rabbit out of a hat and designs a 1,500’ masterpiece, he will be redeemed for his half-assed job at 50 HY. How many of the columns at train yard level need to be replaced to support the larger building? Will this site be able to support the weight of a concrete core or will this be another 30 HY-style/olde skool all-steel design? Will construction disrupt the trains or vice versa? Seeing some renders of the site below grade and the hassle of getting the city to agree to their vision of the public space makes me surprised they are so adamant to stay in the same place.